My firstborn daughter, Alaina Grace, was born on July 26th. She was perfect. Seven pounds, 15 oz, 20 ¼ inches long and a head full of hair. My pregnancy had been completely uneventful other than some morning sickness during the first trimester. My daughter’s due date was August 2nd but my doctor decided to induce my labor early on July 26th. My husband had been 11 pounds at birth and my doctor was nervous Alaina would be a big baby. After the induction, labor went very quickly. Her head was a little large so the doctor had to do an episiotomy, but after that she came right out. Alaina was beautiful, we were so happy to finally hold her. After Alaina was born we stayed in the hospital for three days. Everything seemed great, she was eating well and had regular diaper changes. On the 28th of July we were ready to head home. On the day of discharge Alaina was a little jaundice but it wasn’t severe enough to stay in the hospital. Once we arrived home, everything seemed fine until 8 p.m. that evening. As hard as I tried, I could not get Alaina to stay awake to breastfeed. She seemed groggy but we figured she was just tired from a long day. We finally gave up and fed her with a bottle since she was too tired to breastfeed. Around 11 p.m. she woke up suddenly throwing up green vomit. I immediately started panicking and trying to figure out what was going on. I changed her clothes and she seemed to perk up a bit, which put me at ease. I brought her back to the bedroom and placed her in the cosleeper, at 3 a.m. she threw up green vomit again. When she vomited the second time, I started crying and immediately called the hospital to try and figure out what to do. The hospital staff said they couldn't give medical advice over phone and suggested calling the pediatrician. We called the pediatrician we planned to use, but they said they couldn't take the call because Alaina wasn’t officially a patient there yet. I was so scared, I knew something was terribly wrong but didn’t know what to do. My world felt like it was crumbling. We finally called a nurse hotline who said we should take Alaina straight to the emergency department. We headed to the ER where they ran numerous tests before transferring us to the pediatric unit. The pediatrician took one look at Alaina and rushed to call a surgeon. The pediatric surgeon arrived a few minutes later and told us Alaina had malrotation of the intestine which meant they would need to operate immediately. We were informed they could fix it unless she had a volvulus so severe her intestines had already died. I sat in the waiting room with my husband and family for the next few hours. We prayed and hoped that everything was going to be fine. The surgeon came out several hours later and confirmed our worst fear, the volvulus had damaged Alaina’s entire small intestine. She wouldn’t be able to survive without it. The surgeon said her only hope was the small possibility that the vessels would start pumping blood to her intestines again now that they had been untwisted. Our options were to schedule a second look surgery for the next day to see if Alaina’s bowel had regained any blood flow, or stop everything and let her go on her own. We had only five minutes to decide. I began screaming and sobbing. I couldn’t believe my beautiful girl might not make it. We had gone from a perfectly healthy child to life support in just a few short hours. I kept saying "I don’t know what to do." What kind of choices were those? I wanted to do everything possible but I didn’t want Alaina to suffer. My husband and I were so torn. In the end we chose the second look procedure. We felt that if we didn’t give her every possible shot, we were letting her down. The outlook was bleak but we prayed and prayed Alaina’s bowel would pink back up. Alaina remained on life support to take away the stress of breathing on her own. Our entire family was there by her side, we never left her alone. Alaina’s surgeon also stayed with us and kept my husband and I informed the entire time. Her doctors continued to do everything they could and we spent that day and evening praying for a miracle. At 11 p.m. Alaina’s surgeon took us aside and said her bowel had released gangrene, and it had poisoned her blood. Our last hope for recovery began fading. 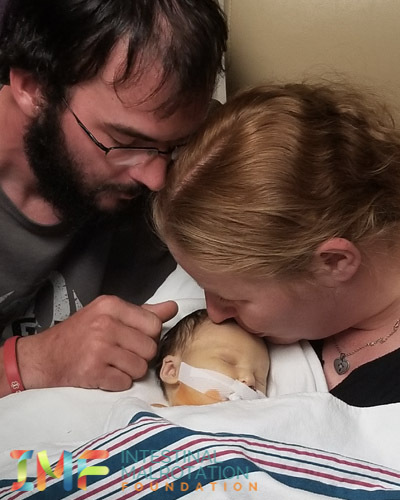 At 4 a.m. our little girl’s heart rate began to plummet. The family gathered around to be with her. She stabilized a bit and my husband stepped out of the room to call his brother and let him know Alaina was fading. While he was gone Alaina’s heart rate dropped drastically again. I panicked and sent someone to find my husband. I whispered to Alaina "little girl, I know you have to go but please wait on your daddy before you leave us." My husband came back into the room as I kissed Alaina and told her how much I loved her. I moved aside so my husband could say his goodbyes. He laid his hand on her head and she finally let go. She had waited on her daddy. I felt a small amount of peace knowing that she had heard us. I held her body in my arms until the funeral home arrived. They were friends of ours and I knew she would be in good hands, but it hurt so bad to let go of her. We buried our little angel on her original due date at our family farm. After losing Alaina I wanted to scream, to die, I wanted to lay in bed all day and not move. I didn't want to exist. Nothing mattered anymore. I had milk but no baby to feed. I had all this love to give. I had an empty nursery where so much hope and happiness had been planned. I wanted to blame myself for everything. I wanted to know why, why my little girl? I also struggled with the what ifs. What if it had been possible to catch this before she was born? What if I had rushed her to the hospital sooner? What if this was somehow my fault? The doctors said there was nothing we did or could have done. Sometimes in malrotation and volvulus there is no warning, sometimes there are no signs until it's too late. Alaina would be almost six months old and I miss her so much. I want to hold her and watch her grow, to crawl and walk. I want to hear her first words. I will never get to experience any of this. The pain is still so fresh. My husband and I are trying to take it one day at a time. We have good days and bad. On my bad days I hold on to her teddy bear and cry. I have the clothes she wore, they still smell like her. I look through all the pictures, I'm so thankful we have them. These things are so precious to me. People say pain will heal with time but I know this will never heal. Instead, I hope to learn to live with it. I try to be thankful for the blessings I had. I had Alaina for four days and some parents don’t get that. I believe we will get to see our beautiful little Alaina again, until that day I will cherish every second I was able to spend with her. If you would like to share your experience with intestinal malrotation, please send us an email for more information.